You can connect the audio system to the Internet using Wi-Fi and browse websites or use online services on the audio/information screen. If your phone has wireless hotspot capabilities, the system can be tethered to the phone. Use the following steps to setup. 4. Select the Wi-Fi tab. 5. 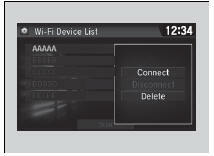 Select Wi-Fi On/Off Status, then On. 6. Select Wi-Fi Device List. Make sure your phone’s Wi-Fi setting is in access point (tethering) mode. Select the phone you want to connect to the system. If you do not find the phone you want to connect in the list, select Scan. If needed, enter a password for your phone and select OK. When the connection is successful, the icon is displayed on the top of the screen. 8. Select to go back to the home screen. You cannot go through the setting procedure while a vehicle is moving. Park in a safe place to setup the Wi-Fi connection. Check your phone manual to find out if the phone has Wi-Fi connectivity. You can confirm whether Wi-Fi connection is on or off with the icon on Wi-Fi Device List. Network speed will not be displayed on this screen. Make sure your phone's Wi-Fi setting is in access point (tethering) mode. You may need to go through an initial setup for Wi- Fi connection again after you boot your phone.